Starting in January (winter quarter) I’ve been taking art classes at Gage Academy in Seattle. One of them was Beginning Drawing. Although I had some crash course in drawing basics by another instructor earlier last year, I signed up for this class in the hope that I could fill in any blanks. Overall I did not learn a lot that I didn’t know already, still it was a good experience and I got more practice. One exercise that we did very early on was a great eye opener regarding space and composition. 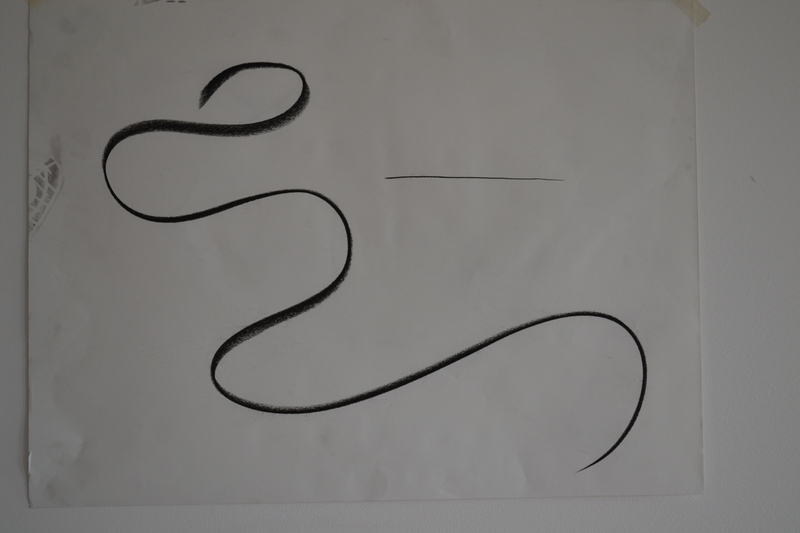 The instructor asked us to draw an exciting line and then draw a boring line. The point was to be emotional and spontaneous. Here is what I drew. 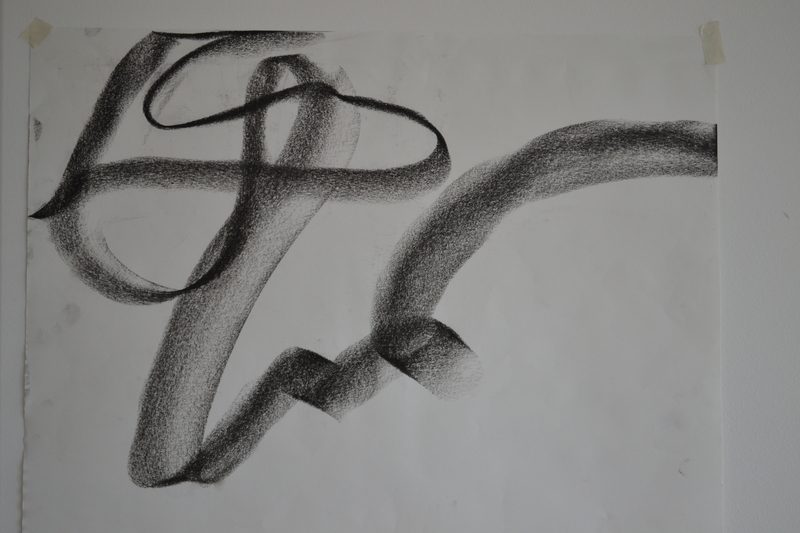 Charcoal on paper – guess the exciting line is obvious, the boring line is the little one in the upper right corner. Note not only the wave (or lack thereof) but also the thickness of the line. He then asked us to draw a line that stays inside the edges of the paper. In doing so we were asked to make it more dramatic, may be using the length of the charcoal (not the tip) or whatever else we could think of to achieve the look of movement and drama. Next he instructed us to draw another line just like the first one (exciting and lively) but this time going off the edges of the paper at least once. Now observe how the dynamic of the drawing changes. The drawing where the line goes off the paper seems to be more interactive. It seems to suggest something happening outside the “frame”. Is that fascinating or what? I certainly thought so. I also was very impressed with the fact that one can express so much with a “simple” line. It seems so emotional, deliberate and artful (especially the first one that stays in the “frame”, my personal favorite) and yet it’s just random, coming out of a more or less emotional movement of the arm/body. I was super fascinated with this exercise. This entry was posted in charcoal, drawings and tagged art, art instruction, charcoal, drawing classes, drawings, fine art, fine art classes, Gage Academy, inspirational, inspire, practice, Seattle on May 12, 2012 by lilo.